Another Cast Member Card? 2/5/13 | Sorcerers Of The Magic Kingdom: The Blog! This entry was posted in News/Rumors and tagged 61-70, Booster Packs, Chip n Dale, disney, Facebook Groups, hints for sorcerers of the magic kingdom, Limited Edition, Master Sorcerer, merchandise, Mickey's Very Merry Christmas Party, MNSSHP, MVMCP, Mystery, Pins, power up t shirts, Prep and Landing, Rare Cast Member Card, Sorcerers of the Magic Kingdom, sorcerers of the magic kingdom card combos, sorcerers of the magic kingdom combos, SOTMK, sotmk tshirts, spell cards, Trading Groups, Walt Disney World, WDW by sotmkblog. Bookmark the permalink. 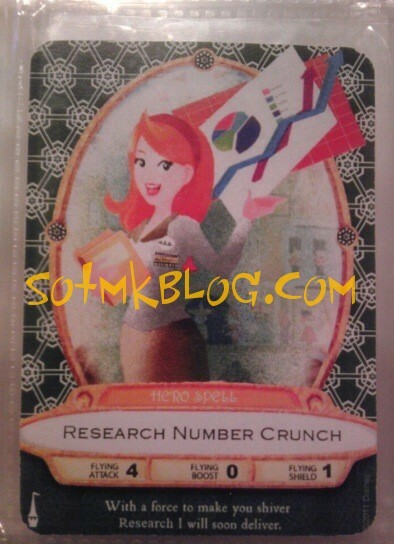 This is not even a real card, it was a cheaply photoshopped ‘card’ given to the research team. It is not even a card, I got mine on a 8 1/2 x 11 piece of paper. Hardly worth mentioning as a card, bc it was made at the cube next to me in my office as a joke. It’s as real as one you guys could make using clip art and print out. Of course it’s not a “real” spell card. Regardless of what it was printed on or how yours was printed it still was a special thing given to cast members. I think it’s neat either way. Looks a lot better than clip art to me. Thank you Laura. For your next critique, please give us the facts on Santa Clause, The Easter Bunny, and Jesus. We all wait with baited breath. As I worked for Research Field Operations Team of Consumer Insights for Disney Parks and Resorts for seven years and received this card in the original meeting this was unveiled in, I’m pretty sure I know what I am talking about. OH, I just realized that was a totally different Laura that posted the original comment. I am a different Laura…silly me. That Laura must work in the offices. I worked in the parks field team actually gathering the research from our guests. The poem at the bottom is one word away from Thumper’s Mighty Thump, saying “research” instead of “thumping.” It also has the same point values and color scheme.